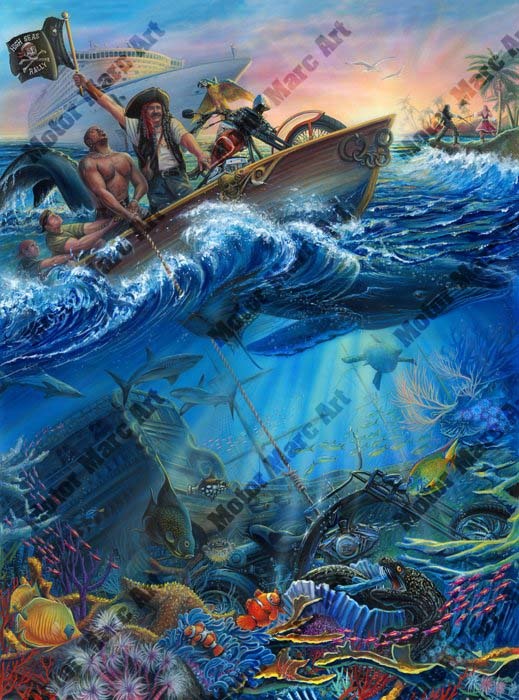 Its custom bikes with an aquatic theme as “Hidden Treasures” goes beneath the sea for this, the second in an annual series of limited edition prints for the Hogs of the High Seas Cruise. The underwater world comes to life as pirates snag sunken treasure and struggle to raise their gleaming bounty to the surface. One of Motor Marc’s finest works to date, Hidden Treasures – Beneath the Sea combines all of the vibrant color and detail of a tropical reef with sunken ships and custom motorcycles. Closer inspection will reveal Marc’s signature style of incorporating hidden details in the painting. Can you find all ?? (how many) This edition sold out quickly on the cruise this year and is sure to become a collector’s item. Five artist’s proofs have been held back and are available for a limited time. Last years prints have dramatically increased in value and Hidden Treasures – Beneath the Sea will be no exception.